PFF’s team of analysts work countless hours during the football season, grading every player on every play of every game at the FBS level. 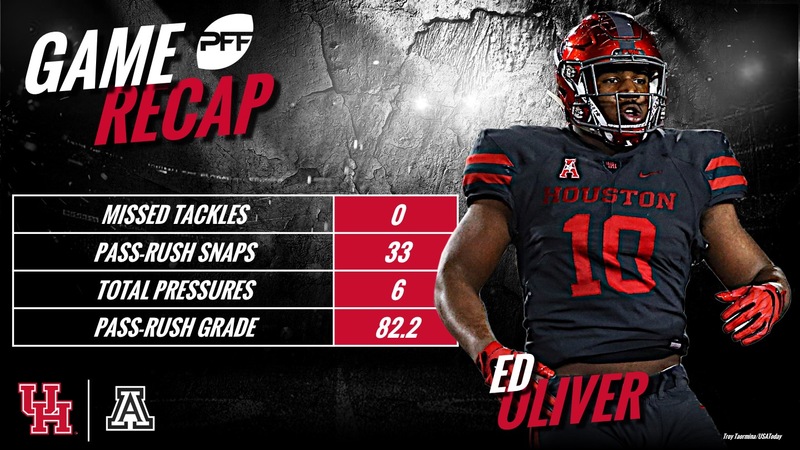 Along with our grades, the PFF data generated from our analysis processes also generate a bevy of advanced statistics that showcase individual standout performances. This list of 20 Stats to Know is brought to you by Eckrich, the Official Smoked Sausage of the College Football Playoff. With that in mind, each week our team of analysts will highlight those standout performances with 20 takeaways from the previous weekend slate of games. 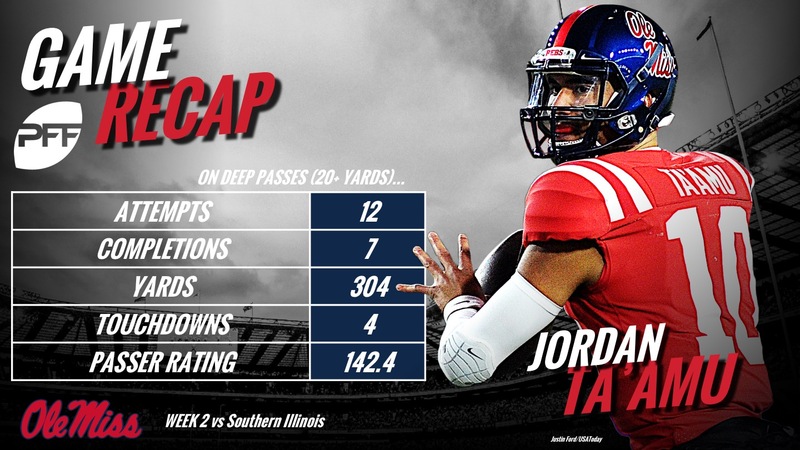 Thomas completed all 14 of his passes for a 100 percent adjusted completion percentage including going 7-for-7 for 242 yards and three touchdowns on passes targeted 10-plus yards downfield. Hit seven deep shots for 306 yards and four touchdowns on passes targeted at least 20 yards downfield for a deep-pass passer rating of 142.4. When kept clean from pressure, as he was on 81.6 percent of his dropbacks, Stockstill connected on 25-of-31 passes (despite having two passes dropped) for a ridiculous 407 passing yards and five touchdowns, tying for the national lead in Week 2. Haskins lit up the field against Rutgers but especially when he allowed his routes to develop, seeing a perfect passer rating of 158.3 on passes thrown 2.6 seconds or more after the snap. 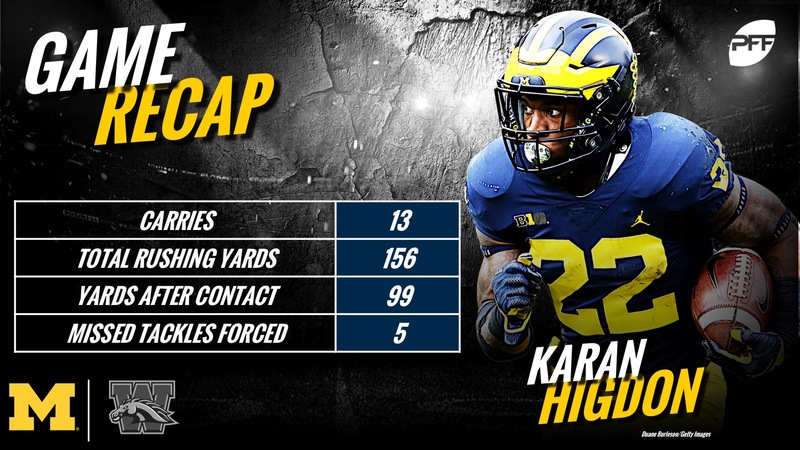 Higdon needed just 13 carries to force five missed tackles while averaging 7.62 yards after contact per rush in Michigan’s blowout win. Earning a spot on our Team of the Week for his efforts, Hill forced eight missed tackles on 17 carries and ran for 211 yards (12.4 yards per carry). Dillon needed just six carries in the game’s first five minutes before his day was done, tallying 128 of his 149 yards on breakaway, 15-plus yard carries and three touchdowns for the afternoon. In Kansas’ first road win in 46 games, Williams was a tackle-breaking machine, forcing 10 missed tackles on just 14 rushing attempts and averaging 7.71 yards after contact per carry. 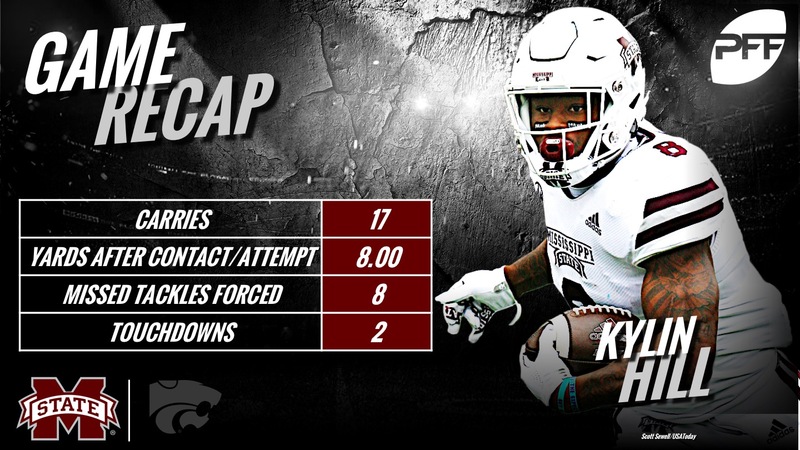 A standard on this list it seems, Brown saw a perfect passer rating when targeted, hauling in 8-of-9 targets for 158 yards and two touchdowns. Running just 10 snaps in route against New Mexico, Taylor tallied 134 receiving yards en route to a ridiculous 13.40 yards per route run average, tops in Week 2. Jennings feasted from the slot for WVU, hauling in 6-of-7 targeted passes for 97 yards and three touchdowns to lead the nation’s receivers. Durant was dominant in pass protection, not allowing a single pressure over 49 pass-blocking snaps in Missouri’s win. Stanley did not allow a single pressure in pass protection against Georgia, joining 47 other FBS centers who accomplished that feat. Stanley, however, led all FBS centers with 52 pass-blocking snaps without a pressure. Oliver notched a career-high six pressures, all hurries, on 33 rushes while Lawrence also accumulated six pressures but on 34 pass-rushes. Leading all edge defenders in Week 2, Burns racked up 10 total QB pressures on 49 pass-rush snaps. Combined for 14 stops (tackles resulting in an offensive failure) against Northwestern. Seven stops, 95.5 grade against the run, the highest run-defense grade among Power-5 linebackers in Week 2. On 35 snaps in coverage against USC, Antoine was targeted just twice, intercepting both passes. Gant was a menace against the run, tallying eight stops for an offensive failure on 30 snaps against the run, all eight of which came when he lined up inside the box (within 8 yards of the line of scrimmage). Thomas recorded two interceptions, joining Houston’s Garrett Davis and Notre Dame’s Jalen Elliott atop the leaderboard among safeties in Week 2. Thomas, however, needed just 20 snaps in coverage to record his two picks while Davis and Elliott saw 33 and 54 snaps, respectively, in coverage.